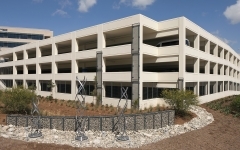 The 825-space parking structure serves the MicroVention Innovation Center complex in the Summit Office Campus of Aliso Viejo, California. MicroVention is a medical device company which focuses on cerebrovascular disease. 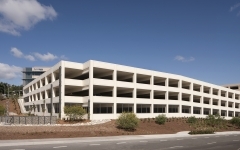 The 268,000 SF, five-level parking structure is integrated into the site topography such that entry points occur at three different levels. The lowest level of the garage is accessed directly from the public street with two additional entries from the interior roadway accessing the fourth and roof levels. The roof level of the garage is flush with grade, adjacent to the main building entrance, providing convenient at-grade parking for visitors to the site.